DC Tyres cc is your specialist truck & earthmoving tyres, rims and related services provider. Established in 2000, we supply, service, repair and retread a full range of tyres for a diversified range of industries that include the earthmoving, mining, transport, construction, plant hire, powersport and agricultural sectors. We have a well developed supply chain of local and international heavy duty tyre manufacturers that enable us to provide best diversified products at best prices. We also offer a repair and retreading service as well as good quality retreaded tyres supply. Our qualified and experienced staff can assist you with industry advice and in finding a winning solution for every requirement, every time. 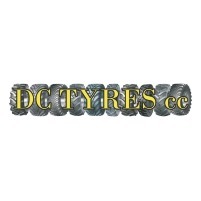 D.C.Tyres is a customer driven enterprise committed to honesty, integrity, excellence and end-user satisfaction. We are well known in the heavy duty tyre industry for our professionalism and superior service levels. Tags: New tyres, used tyres, truck tyres, tubes, recon, repair, servicing, inch, “, recap, rims, forklift tyres, survey, foam filling.